Though I finished up the final lesson of the Creative Prayer Book last week, I wanted to share a wrap up of the project, and create a video that shows a flip through the pages. I began this project several months ago, and I’ve been sharing a new lesson each week as I built up layers in a small Stillman & Birn journal to create a small book of creative affirmations. I am a long way from calling this project finished, and I only got about halfway through the book. I still have many more pages to fill, but I wanted to wrap up the lessons and finish the book on my own time. I plan to continue working over the coming months, and hopefully I’ll be able to share the filled journal fairly soon. I want to thank everyone who has followed along on this journey, and who drew inspiration from my ideas, techniques, and methods. I am grateful for the positive comments and feedback that I’ve received over the months. It has been a good challenge to bring a new lesson to you each week, and I’m hoping to create a new project in the future. So thank you all so very much, and as always, Happy Creating! Welcome to the ninth lesson of the Creative Prayer Book. In this lesson, I continue to add text to my book. As I’ve said before, I’m creating a book of creative affirmations, but feel free to add hopes, wishes, dreams, prayers, or quotes to your book. Over the past couple of weeks, I’ve been adding text using stencils and my own handwriting, but for today’s lesson, I want to add some found text — text from alternative sources. I’ll use some of my own handwriting in conjunction with this found text, but I want to find some of the words in other sources or create some of it in a different way. I turn to some readily available sources of text for my words today — magazines, stickers, and a label maker. Magazines are a great source for text, but I want to use big words, so I look for headlines and advertisements. I probably won’t be able to find very word in the phrase that I want to use, but I can probably find a a couple key words. I spend time flipping through magazines to find words that will work. Newspapers are also a good source of headline text. Arts and craft stores often have sticker sets of words meant to be used in scrapbooking and mixed media art. I happen to have a set that I bought a long time ago in a stash of fodder in the studio. The words all deal with travel, and contain quite a few key words from a number of my affirmations. Don’t feel like you need to make a special trip to the store of sticker words, but if you have some lying around, feel free to use them. Label makers are great as an alternative source of text, and some electronic ones allow you to change the size and the font. I have an old embossing label maker from many years ago, and I think that it would be perfect for using for this lesson. This is the type that uses plastic tape and pushes the letters up into the plastic causing the letters to be raised and to turn white. I used to use it a lot when I first got into journaling, but I haven’t used it in quite a while. I use it to create whole phrases and to add key words. Think about printing out words from the computer if you don’t have a label maker, but use one if you got it. I was surprised to see that Dymo still makes the embossing type of label maker similar to the one I have. I do use my regular handwriting for some of the words that go with the magazine text and label maker, and if I wanted, I could thicken the letters like I did last week. But, I’ll wait because I have some ideas for embellishing the text in different ways, and I’ll save it for a future lesson. Think about ways that you can use found text or words from alternative sources as you continue to add your affirmations, prayers, or quotes to your book, and until next time, Happy Creating! I got back a few days ago from the annual Art and Soul retreat in Portland, OR, but it’s taken a few days to recover. Travel is always good, but it tends to wear me out. I’ve taken it easy the last couple of days, but now’s time to get back into the swing of things. So, I thought that I’d reflect a little about Art and Soul to kick off the week, and perhaps I can squeeze a new Materials Monday in before the end of the day to get back on track with those as well. But onto Art and Soul! I must say that I had a blast in Portland, and the week just whooshed by so quickly. I flew in on Monday, and didn’t have a class until Tuesday evening. So I grabbed lunch with a friend who lives in Portland, and spent a couple of hours wandering downtown Portland. I was almost late for my own class when I narrowly missed the train back. Luckily a train runs every 15 minutes, but that 15 minutes difference meant that I was nearly running to get back on time. Luckily I got to class with 5 minutes to spare, and we had a great class. I taught my Artful Layers class which I’ve done before as an all-day and a 2-day workshop, but this time it was a three-hour evening class. I was so into the class that I completely forgot to take photos, but we had fun layering watercolor, watercolor pencil, collage, and more. On Wednesday I taught my Monster Maker Workshop as an all-day class, and we had so much fun creating little creatures in watercolor, polymer clay, and collage. It was a small intimate class, and I remembered to take photos. I’ve had so much fun making my monsters over the past several years, that it was good to see others who enjoyed it just as much. Beyond Blank Pages was my all-day class on Thursday, and it was great to teach a brand new class. I developed the class as a week-long workshop for the John C. Campbell Folk School, but it was cancelled due to low enrollment. I turned it into a one-day class for Art and Soul, and we spent the day creating pages that linked together through color, repetition, cut-outs and more. Though it’s based on journal workshops that I’ve taught before, it’s a new spin on the journal as you try to consciously create a visual narrative that runs through the pages as ideas, themes, colors, lines, and more all connect from page to page. I had a fantastic time working with the students, and it was so nice to see so many new faces. Though a couple had taken classes with my before, most were brand new, and many knew very little about me or what I do. I’m so glad that my classes appealed to them. Teaching at Art and Soul last week reminded me why I teach — to connect with others and to share my love of art. I am grateful for everyone who came out and made art with me, and I am looking forward to next year! In the meantime, I have a couple of other teaching gigs lined up for 2019, and I’m hoping to add more. In May, I’m teaching the Creative Prayer Book as an all-day workshop at the Round Hill Arts Center in Round Hill, VA. In October, I’ll be repeating Artful Layers, Monster Maker Workshop, and Beyond Blank Pages at Art and Soul in Ocean City, MD. Welcome to the 7th lesson of the Creative Prayer Book. This lesson is all about using letter stencils to begin adding text to some of the pages. I’ve decided to use my book as a book of affirmations, and I’m using a series of phrases, quotes, words, and ideas to create reminders about my creative journey. Several years ago, I wrote a bunch of these affirmations on index cards with the notion of using them in my journal or my art, but they have been sitting around my studio all this time. The Creative Prayer Book is a perfect use for them. I can use one of my favorite materials, Derwent Inktense pencils, to create some contrast around the letters so that the words stand out from the page. I trace the letters first with my black uni-ball Vision pen, and then shade a dark Inktense pencil around the letters and spread it with plain water. This makes the words stand out a bit from background. If the color isn’t dark enough, I can add a darker color later. Another technique for making the words stand out is to fill them with color, and I could simply fill them in with solid color. But I like to fill them in a slightly more creative way. I like using my uni-ball Vision pens and leave a white line around the edge of the letters giving the letters a bit of a sophisticated look. By drawing a shape inside of the letters that runs parallel to the edge of the letters, I can then fill the shape to create a two-tone letter. I really like the look of this technique. Think about using stencils in your book since their are a quick and easy way to add text and word. If you want to add a bit of flair and make the words stand out, try using a little ink or Inktense pencil to add some visual interest to the letters and make them “pop.” Try experimenting with letter stencils, but don’t fill all of your pages because we’ll tackle some other lettering techniques in lessons to come. Welcome to the fifth lesson of the Creative Prayer Book. I’ve built up several layers using watercolor, graphite pencil, collage, watercolor pencil, and ink in previous lessons, and I was originally thinking of using collage for this lesson. But as I worked with the ink this past week, I felt like I wanted at least one more layer before diving back into using collage. To create this layer, I pulled out my Derwent Inktense Pencils, which I discussed at length in this week’s Materials Monday. The Inktense are used just like watercolor pencils, but they are all very transparent since they are water-soluble ink instead of watercolor. This makes them perfect for layering over other materials. My main goal in this lesson is to use the Inktense pencils to reinforce the structure of the pages. Last week, I used lines and shapes drawn with ink to experiment with layout and composition on my pages, and this week I use the Inktense to create contrast that will heighten the structure and make the pages more dynamic. Since the Inktense work just like watercolor pencil, I use my technique of shading around shapes and fading the color into the background with plain water. This gives me a chance to shift the colors on my pages by give adding a tint of one color or another, and allows me to make shapes and areas pop out. The darker color in certain areas fades into the background making the lighter areas stand out more. Try experimenting with water-soluble pencils to see if you can reinforce the composition of your pages, and if you don’t have water-soluble pencils, watercolor crayons will work just as well. You could also just use watercolor paint to create a similar effect. No matter what, have fun building layers! The fourth lesson of the Creative Prayer Book is a quick lesson about using ink to add another layer or two to my pages. I turn to my favorite ink pens — my uni-ball Vision pens, and I make certain that they are waterproof. Since I may want to paint or use a wet material in a future lesson, I want to minimize bleeding. The ink may bleed and blend a little if I paint over it, but not a lot. I use the pens in three main ways — to connect pages, to create structure, and to add texture. One of my goals with the Creative Prayer Book is to try to make it so that the pages feel connected, so I’ve been trying to make sure that colors, lines, and textures flow and repeat from page to page. I do the same with ink. I draw lines that act like threads that bridge and tie pages together. Two-page spreads are easy to connect, but in order to tie back-to-back pages together, I wrap the lines around the edge of the page so that they continue from one page to another. By extending these lines, I can tie together quite a few pages. Another way to connect pages is through repetition. By repeating lines, shapes, and textures, I can tie my pages together. Another way that I use the ink pen is to draw lines and shapes to divide and break up the space of some of my pages. I use a lot of rectangles, squares, and straight lines to create structure and to create interesting spaces within my pages. I use big and little shapes to have some variety, and I thicken some of the lines so that they stand out. Some of the shapes might be filled in later with images and drawings, and others will be left as generic structural elements. In the previous lesson, I used watercolor pencil to add texture to some of my pages, and I want to reinforce that with ink, so I use some of the punchinella, plastic mesh, and circle templates to trace patterns on some of my pages. This repeats some of the elements that I’ve already used, and creates some additional visual interest. The marks and shapes that I make are other small, and I try to spread them throughout my pages so that they don’t create too much emphasis. With everything that I’ve done so far in my little book, I’ve been laying the foundation and slowly building layers. I’ve thought about what affirmations that I want to use, but I haven’t made any hard decisions about exactly which ones will go where. But I’m starting to think about it, and I’m looking forward to seeing how things will develop. I hope that you’ll try experimenting a little with ink as you build in more layers into your book, and as always, Happy Creating! Welcome to Lesson 3 of the Creative Prayer Book. So far, I’ve built a couple of initial layers using watercolor, pencil, and collage, and I’ve begun quite a number of pages in my small Stillman & Birn Alpha Series softcover journal. Now I want to focus on creating some structure and texture using watercolor pencil, as a way to add more layers. I’m a big fan of using a variety of materials to create rich layered pages, and one of my favorite materials to use for this is watercolor pencil. The pencil gives me a lot of control, but with a little water, I get some nice painterly effects. Watercolor crayons can be used as well, and act in a similar manner. I want to use the watercolor pencil in two main ways in my little book. The first is to create some structure using some simple geometric shapes — mostly squares and rectangles. Most people might think to color or shade in the shape, but I like to shade around the shape. This creates a “window” effect when I paint plain water over the pencil. I can use this technique on top of pages that already have something on them, but I could easily use the technique to start new pages. I could use watercolor paint or a water-based marker to activate the watercolor pencil, but I use them mostly use plain water. Feel free to experiment and explore the pencil. The second way that I use the pencil is to create textures and patterns on top of my pages. I can trace stencils and items to create patterns, and I can use marks, dashes, dots, and more to create textures. Again I use water to activate the pencil, but I spread the water all over the marks to make them blend into the page. As I work with the watercolor pencil, I also begin to think about the content that I want to include in my book. I’m envisioning my book as one of creative affirmations — words, phrases, and quotes that will be reminders and motivators for my creative journey. I hope that you will experiment with watercolor pencils, and begin to think about the content, the prayers, the affirmations, the words that you want to include. Last week I eased into my Creative Prayer Book with a variety of techniques using watercolor paint, so this week in Lesson 2, I want to build some initial layers on top of the watercolor. I’m not too focused on the content of the pages yet, so I’m only using materials and techniques that will add some structure, color, pattern, or texture to the pages. I’m avoiding anything with a strong image or content, and this will allow me to build up the background before delving into the meaning making. I want to add some drawing with pencil and some simple collage as a way to begin building layers..
Just like with the watercolor paint, I’m focusing on allowing the pages to flow from one to another, so I want to use lines and shapes to transition from page to page, so I wrap some of the collage around the edges of pages and repeat some of the same shapes from page to page. This helps connect the pages together, and helps tie the pages into a cohesive whole. Adding simple lines and shapes with pencil is an easy way to add more to the background. The value of the pencil is subtle and doesn’t stand out too much, allowing my marks to fade into the page. I like to use geometric shapes and lines, and rectangles, and straight lines add a lot of structure and help divide up the space of the pages. Circles and curved lines, on the other hand, help to add some variety and visual interest to pages. Feel free to use any types of lines, shapes, or marks that you want. Perhaps avoid drawing representational images, and keep your mars on the decorative side. Collage is a big part of my journal practice, and I always have a pretty big stash of ephemera to use. Just like the pencil drawing, I want the collage to be somewhat subtle, so I don’t have anything with imagery. Newspaper, book pages, raffle tickets, maps, and colored paper all add some color, pattern, or texture to the pages without hinting at content or meaning. UHU glue stick is my go-to adhesive. I know some people have issues with glue stick, but when used effectively it works great. Besides, glue stick is the most appropriate for the materials that I use. A lot of people use an acrylic medium as a glue, but watercolor and watercolor pencil just won’t stick to the acrylic. Dig through your stash of papers and materials and find things that you want to glue in. Try experimenting with some drawing and collage to build some layers on your pages, and don’t worry yet about what the content will be. We’ll get to that in future lessons, so have some fun building some initial layers and using up some of your fodder stash. Just like with the watercolor, work on as many pages as you wish, and remember that you don’t have to include the drawing and collage on every page. Welcome to the first lesson in the Creative Prayer Book. In this lesson, I’m using watercolor paint, but feel free to use whatever material you wish. My main objective is to simply engage the blank pages of my book and get backgrounds started on some of my pages using the watercolor paint. I want to get a good number of pages started, so I’m jumping around in my book and not worrying about trying to make finished or completed pages yet. I’m not even worrying about the prayers or quotes that I will eventually use. I just want to get started working in the book. Depending on the number of pages your book has, you might engage all of your pages or you might focus on a certain number of pages. It also depends on how much time you have, but even if you only have 15 or 20 minutes you can get started on quite a few pages. In the video, I only show a few techniques, but I am concentrating on trying to allow colors and techniques to flow from one page to another so that one page ties into the next. I can do this by using similar colors, lines, and shapes or by simply continuing what I did on one page onto the next. Use any techniques that you like, but below are a few to try that I show in the video. Wash - A wash of watercolor paint is a light thin layer of paint. By keeping the color light at this point, it makes it easier to build layers later. It might be difficult to deal with dark colors later on as I draw, paint, and write to develop the pages further. Blends and Bleeds - Two wet colors of watercolor will bleed together when they touch, allowing you to blend colors together to create gradients. This allows you to add some variety of color to your pages. Splattering - By flicking the bristles with your finger, you can create tiny splatters of paint. This is perfect for adding a bit of texture to blank pages or to pages you’ve already started. Found Stencils - Items like plastic mesh make great stencils for adding textures and shapes to your pages. By painting through the openings you can add subtle patterns, but with thicker items, you might have to use a stiff brush and tap the paint through the openings. Layering - Don’t be afraid to go back and add color, brush marks, lines, and textures on top of pages that are already dry. You can create visually interesting backgrounds that way. If you you’re interested in other techniques, try using plastic wrap, salt, rubbing alcohol, sponges, or string with the paint. Just experiment and have some fun with the paint as you create backgrounds, and don’t worry about being neat or tidy. Don’t worry about filling the page completely, and work on as many or as few pages as you wish. Just keep the colors on the light side so that you can layer and add in future lessons. Next week, I’ll focus on adding collage and a little drawing to these pages and to blank pages as well. Last week I received two small, softcover sketchbooks from Stillman & Birn for being one of the winners of their Holiday Giveaway. I’m already a fan of their sketchbooks, and I’ve used several of their 5.5”x8.5” inch hardbound sketchbooks over the past couple of years. Winners got to pick books from one of their six series, and I chose the Alpha Series which has 46 sheets of white, medium grain paper with a weight of 150gsm. The size and format of the smaller book really intrigues me. At 5.5”x3.5”, it’s quite small, but the landscape format is one that I’ve never worked with before. I want to push myself to do something different with it, and I want it to be a project — something very specific and purposeful. I’ve decided to use the idea of a prayer book to focus this project. Now I’m not a religious person, but I am spiritual. I believe that the act of creating is a spiritual act, so I want to fill the book with ideas, words, quotes, and phrases about creativity and making art. This way I can have a little book to flip through anytime that I need a reminder or a little creative nudge. Welcome to the Creative Prayer Book! You’ll need some kind of book — something small with a limited number of pages is good. That way you won’t get bogged down with trying to fill a huge number of expansive pages and be overwhelmed with the process. Something around 4”x6” is good, and you can purchase something or make your own. Perhaps get something with sturdy watercolor or mixed media paper. The Stillman & Birn book that I am using has good paper for mixed media, but it can buckle and bend from the wet media, so if that drives you crazy, get a heavier weight paper. I want this to be something that doesn’t need a special place or special materials, so I’m using materials that I can use anywhere at anytime. I don’t want to load myself down with materials that I can only use in my studio or anything that’s too complicated. I love working with transparent layers, so watercolor and watercolor pencils are a must for me. I’m definitely going to use collage, so I’ll need my jumbo UHU Glue Stic. Of course, Ill be writing and drawing so some waterproof pens and markers are good, as well as a pencil or two and a couple of metallic markers. Each week, I’ll share the materials and tools that I’m using, so you can add other items as needed. Next week, I’ll share some watercolor ideas as I start to engage some of the pages and ease my way into the book. 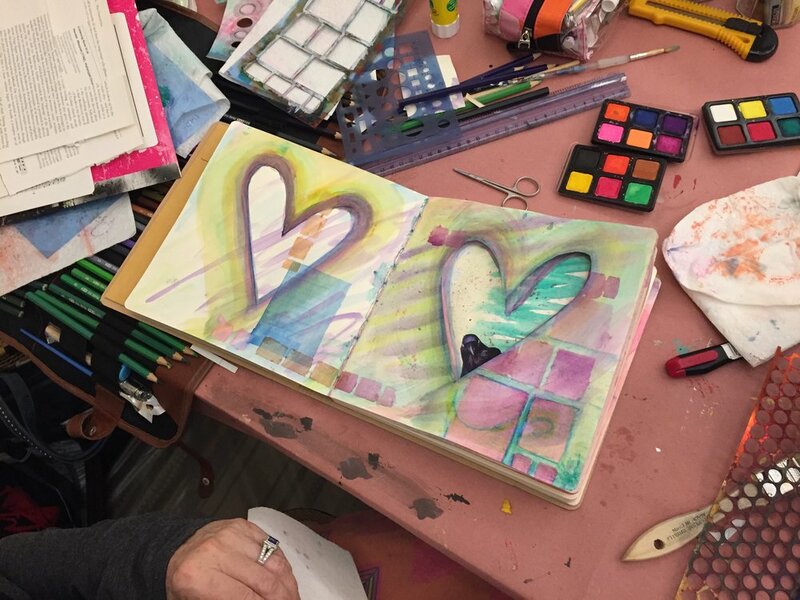 Grab a journal and some art materials, and come create with me!